Contemporary political systems fail to address climate change effectively to the degree that they lack deliberative capacity. Deliberative capacity can be defined as the degree to which a system hosts authentic, inclusive, and consequential deliberation. Deliberation, in turn, means communication that is non-coercive, capable of inducing reflection, connects expression of particular interests to more general principles, and involves the making of arguments and telling of stories in terms that make sense to others who do not share one’s particular framework. Systems that lack deliberative capacity tend to do badly on climate change. In particular, the climate issue clearly reveals the pathologies of adversarial democracies such as the United States and Australia, where all issues are processed in terms of partisan advantage. Over the past two years, Australia has witnessed a struggle over the introduction of a very modest carbon tax. The leader of the conservative opposition saw an opportunity to use the issue to beat up the government (while still paying lip service to the need to do something to reduce greenhouse gas emissions). Labeling the carbon tax “a great big tax on everything,” his campaign was successful in damaging the government’s public standing. The government, for its part, continued to push the tax only because of its parliamentary dependence on Green Party support, itself conditional on the tax going through. The carbon tax is now in operation—though in highly compromised form, full of exemptions and compensation packages for big and powerful polluters. Why might a more deliberative democracy do better? There are a number of theoretical claims that can be made on behalf of deliberative democracy when it comes to intractable social-ecological issues like climate change. It can generate coherence across the perspectives of actors concerned with different facets of complex issues. It can organize feedback on the condition of social-ecological systems into politics. It can lead to the prioritization of public goods (such as ecosystem integrity) and general interests over material self-interest. It may even expand the thinking of its participants to better encompass the interests of future generations, distant others, and non-human nature. These theoretical claims find empirical support, especially in citizen forums designed to deliberate climate change (and other environmental issues). The biggest such exercise to date took place on September 26, 2009, in 38 countries following a common model coordinated by the Danish Board of Technology. This “World Wide Views” process yielded recommendations that, in just about every country, favored stronger action on climate change than the national government in question was at the time prepared to support. The results were presented at the December 2009 Conference of the Parties to the United Nations Framework Convention on Climate Change in Copenhagen (to little effect). Other sorts of deliberative forums involving partisans from different sides on environmental issues can also yield positive results, though there is little evidence from partisan forums on climate change per se. Evidence from citizen forums goes only so far because they, for the most part, lack any link to actual governance. But there are other sorts of evidence. If we look at the comparative performance of different countries when it comes to tackling pollution, in general, and climate change, in particular, we find that consensual democracies of the sort found in Northern Europe do better than adversarial ones (with the important exception of the United Kingdom, which, for a few years, seemed to have broken the mould by showing that an adversarial democracy could generate a relatively effective response to climate change until, more recently, climate skeptics gained the upper hand in the Cameron government). Consensual democracies also feature somewhat higher deliberative quality than adversarial ones, at least in their legislatures. All this is relative: no consensual democracy has yet turned in a performance on reducing greenhouse-gas emissions that can be regarded as adequate. In addition, there may be a problem inherent to consensual democracies. They are good at incorporating moderate versions of environmentalism and acting accordingly. They are not so good when it comes to generating and accepting more radical critique, which consequently has to be generated elsewhere. There is a subtle dynamic in operation here that points to the need for both moments of consensus and moments of contestation, which can be joined in the idea of a “deliberative system.” Moments of consensus may be appropriate in the formal institutions of government—while moments of contestation should be cultivated in the broader public sphere. This deliberative system idea can also be applied beyond the boundaries of the nation-state. Climate change is, of course, in large part a global issue, requiring coordinated global action. Electoral democracy is a non-starter in the global system. But we can think of the global governance of climate change as a potentially deliberative system—however far it might currently be from deliberative ideals. That system as a whole can then be analyzed in terms of its deliberative capacity—and how it might be enhanced. The result would be collective outcomes with higher legitimacy, and so greater likelihood of getting compliance from states, corporations, and others. Equally important, outcomes could be much more effective than those currently generated in the global governance of climate change, whose performance over two decades is dismal. That effectiveness depends, of course, on the degree to which the environmental promise of deliberative democracy could be redeemed at the global level (where it has never seriously been tried). 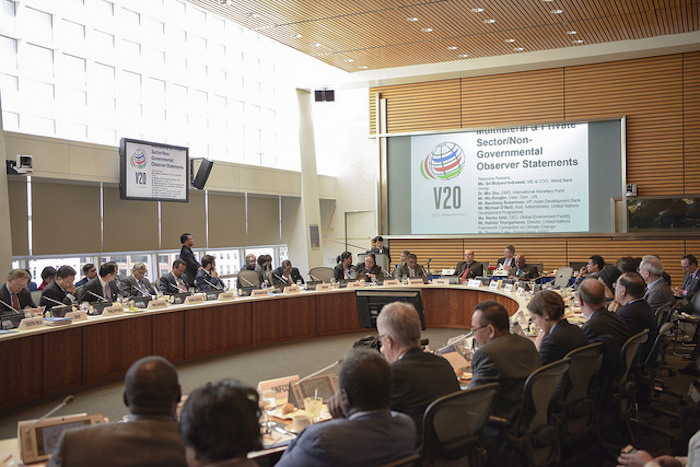 What would such a global deliberative system look like? It would have room for multiple forms of governance beyond the multilateral negotiations of the UNFCCC. Many such forms—networks to organize clean technology transfer, emissions trading, or the sharing of information and commitment, for example—are emerging, though in practice they are not very deliberative. Currently, the global public sphere on climate issues is lively and contestatory—but its activity tends to have minimal connection to governance, especially when it comes to these new forms. Both transmission of concerns generated in this public sphere and accountability to global civil society can be strengthened. There are numerous reform proposals for global governance now on the agenda, and all could benefit from a deliberative aspect. In short, failure to act effectively on climate change is not a failure of democracy. Rather, it results from the fact that so far we haven’t done democracy right. And a big part of doing democracy right is doing democracy deliberatively. John Dryzek is Professor of Political Science and Australian Research Council Federation Fellow at the Australian National University. His work in environmental politics ranges from green political philosophy to studies of environmental discourses and movements.